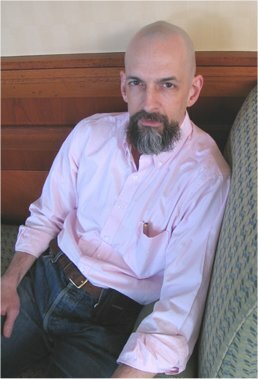 Neal Stephenson was born in Fort Meade MD and grew up in Iowa. He graduated from Boston University with a BA in geography and a minor in physics. His first novel The Big U, a college thriller with SF elements, appeared in 1984, followed by Zodiac: The Eco-Thriller (1988). The successful and influential Snow Crash (1992) is a cyberpunk classic and made him a star in the SF world. He wrote two thrillers in collaboration with his uncle, George Jewsbury, under the name Stephen Bury: Interface (1994) and Cobweb (1996). Returning to solo work he produced the Hugo and Locus Award-winning novel The Diamond Age (1995). In 1999 he broke new ground with Locus Award winner Cryptonomicon, his massive, Pynchonesque novel of history and cryptography, which proved quite popular with SF fans. Later that year he published In the Beginning... Was the Command Line, an often humorous non-fiction commentary on computers and culture that originally appeared in shortened form on the Internet. He also contributes occasional non-fiction articles to Wired. Stephenson spent seven years at work on his vast three-volume Baroque Cycle, which includes the Arthur C. Clarke Award-winning Quicksilver (2003), The Confusion (2004), and The System of the World (2004). These books, set in the 17th century and featuring historical characters like Leibniz and Newton along with the ancestors of characters from Cryptonomicon, pushed the boundaries of SF. His latest novel, Anathem (2008), is another long, complex book, although more purely SF than his other recent works. “I was interested in our concept of 'news.' At the end of the year, every year, the newspapers publish a roundup of the best in the news. When I started thinking of Anathem, they were also publishing their end-of-decade news roundups; some were publishing end-of-century and end-of millennium roundups. Every morning I'd sit and read all this stuff that I wouldn't remember the next day. Why was I spending all that time reading the news every day, when I could just wait until the end of the year and read the summary and get the important stuff? “The main character isn't some austere monk; he's a teenager. Though I hate to use a sugary, vague word like 'inspiration,' a lot of that was inspired by the way Heinlein had a knack for populating his novels with characters who are about this age. It just works to have people that age in a book like this, because otherwise it can be too serious, too somber: a bunch of grown-ups sitting around talking about serious things. From the very beginning, I wanted it to have a little bit of a flavor of Heinlein young-adultish books. You get to learn about the world along with the characters. “I think one reason this idea kept bobbing to the surface after I finished the Baroque Cycle is the way I would see it every day, reading e-mails and living the life that I do, reading fewer and fewer books. I myself have become so much a part of the electronic, ephemeral culture that I can just feel book reading get pushed out of my life by e-mail or other distractions. The full interview, with biographical profile, is published in the September 2008 issue of Locus Magazine.